Miss Scarlett comes fully equipped with everything you’ll need for your trip away, all you need is bedding! Check out our What’s Included page for more information! Miss Scarlett was built in Wolfsburg in January 1986 for the German market. 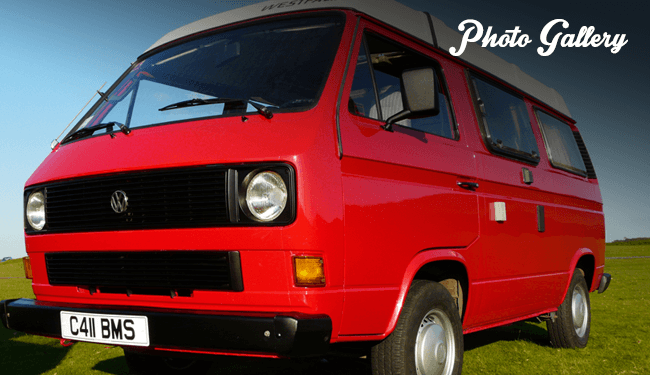 Before being registered on the 20th May she was shipped directly to Westfalia-Werke in the town of Rheda-Wiedenbrück to be converted into a motor caravan. Fräulein Scarlett went on to enjoy the majority of her life in Germany. She was later brought to England and was first registered here on the 11th of June 2007. Wye Valley Campers spotted her and bought her privately in summer 2011. Since then she has undergone a thorough revamp and is now in excellent condition for trips around the UK and the continent. Click here to book Miss Scarlett!